The educational objectives for each rotation are designed to address all the Core Competencies set forth by The Accreditation Council for Graduate Medical Education (ACGME). 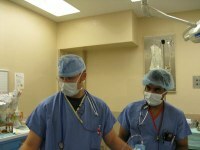 General Anesthesia rotations will be done in the main OR of the University of Louisville Hospital and at the VA throughout the residency. By the end of the first clinical year rotation the resident will have obtained a level of performance consistent with a basic knowledge and understanding of anesthesia. By the end of the clinical third year the resident will have obtained a level of performance consistent with an ABA-boarded consultant in Anesthesiology. The Perioperative Medicine rotation is a two-module (eight-week) rotation in the CA-1 year that will teach the elements of anesthesiology that occur outside the operation room, excluding critical care and pain management. Curriculum: The service combines the clinical care and academic skills of patient care for preanesthesia testing, post anesthesia care unit (PACU) and the anesthesia consultation service. Night-call is waived on this service, and day-shift hours are extended to maximize clinical contact. All patient care is supervised by sup-specialized faculty who combined education with clinical supervision. The work schedule is designed to allow a teaching session between 9-10:00 a.m. on Tuesday, Wednesday, and Thursday and a core curriculum has been designed to achieve the teaching objectives of the rotation. A teaching manual has been designed to complement the teaching sessions. A list of key words, designed to focus study and use of the manual, is distributed prior to the rotation. This rotation serves as the core part of the planned 6 month training rotation in critical care medicine. This specific core critical care rotation occurs late in the CA1 year or during the CA2 year. During the rotation, the resident will be assigned to the Neuroscience and Anesthesia Intensive Care Unit (NICU) at U of L Hospital and will be supervised by the anesthesia-intensive care faculty. The remaining 4 months include a junior level rotation during internship (PGY-1) year as well as a more advanced level rotation to be done in the senior (CA-3) year. Curriculum: This rotation provides hands-on and intellectual background for care of critically ill adult patients with both surgical and medical illnesses. Residents provide primary care for assigned ICU patients, attend didactic conferences, are actively involved in bed-side case discussions, and participate in morbidity & mortality discussions. Successful completion of the rotation requires demonstration of his/her ability to assess and manage patients with a variety of neurosurgical, neurological diseases, massive trauma, and multiple organ failure. The objective of the obstetrical anesthesia rotation is for the resident to function as part of a team composed of obstetricians, neonatologists, nurses and anesthesiologists. 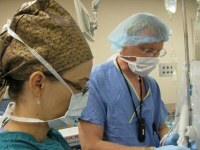 The goal of the anesthesiologist is to provide safe and effective analgesia and anesthesia for women in the peripartum. The CA-1/2 residents will spend two months on labor and delivery, and at the end of the rotation they will be expected to have the knowledge and skills to safely care for the pregnant and postpartum patient. The CA-3 resident will be given increasing responsibility as his/her knowledge and skill level increases. 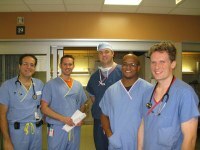 Each anesthesia resident will spend one to two months on the neuroanesthesiology service. At the end of the rotation, it is expected that the resident should be qualified to plan and perform a routine neuroanesthetic. Neurosurgical procedures which the resident is expected to be conversant with include craniotomy for trauma, functional neurosurgery, tumor or cerebrovascular disease, cerebrospinal fluid shunting procedures and operations upon the spinal axis. Additionally, it is anticipated, following this rotation, that the resident be able to discuss relevant topics regarding neurophysiology, neuropharmacology and common neuroanesthetic considerations. 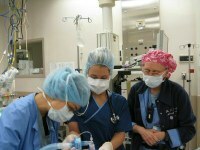 In the CA-3 year, senior residents may elect an additional month experience in neuroanesthesia. During this period the resident will refresh his/her knowledge of cerebral anatomy, physiology, and pathophysiology. They will review all techniques learned during the initial rotation. 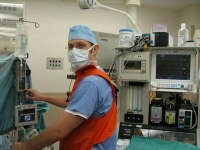 The CA-3 resident will be expected to perform, review, and critique an anesthetic for a complex neurosurgical procedure. This is a 1-month rotation, which can be repeated at the resident’s request and the department’s discretion. The rotation can be done during CA1, CA 2, or CA 3 year. The resident will be assigned to the operating rooms at the Veterans Administrations Hospital and will be supervised by anesthesiology faculty from the University of Louisville. This is a unique opportunity in which four residents will be working closely with a group of 3 or 4 faculty members for one month. The residents are given a lot of feedback, enabling them to work on specific areas for improvement in skils. The rotation in Pain Medicine is designed to prepare anesthesiology residents for the care of patients suffering from acute and chronic pain conditions including cancer pain. Residents are expected to complete a 2 month rotation and are assigned to the University of Louisville Health Care Pain Management Clinic and occasionally Louisville Veterans Affairs Medical Center. Curriculum: The program conforms to ACGME criteria and includes both didactic and handson education in the medical and interventional management of acute, chronic and cancer pain patients. Emphasis is placed on comprehensive multi-disciplinary approach to evaluation and treatment, including interventional procedures. This is a one month rotation during the CA-2 focused on the development of skill and knowledge to effectively manage the pain of surgery in the operative setting for anesthesia and the post-operative period for analgesia utilizing regional anesthesia, consisting of neuraxial, peripheral neural blockade and pharmacologic techniques. Additional months are optional in the CA-3 year. 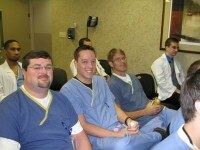 The rotation is at the University of Louisville Hospital. Call is from home, and is shared with the Chronic Pain Residents and Pain Fellows. This is a 2-month rotation that will occur late in the CA1 year or during the CA2 year. The resident will be assigned to the operating rooms at Jewish Hospital and will be supervised by anesthesiology faculty at Jewish Hospital. 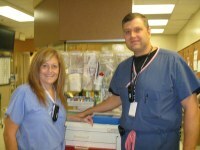 An additional month at Owensboro Medical Health System is offered during the CA3 year. 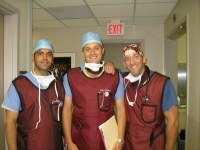 This rotation provides a broad exposure to all elements of anesthesia for adult cardiac surgery. 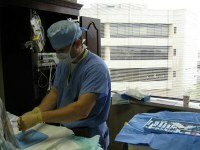 The curriculum is designed to provide the resident with hands-on and intellectual background for perioperative care of patients for all forms of cardiac surgery, including coronary revascularization, valve replacement, valve repair, arrhythmia surgery, heart and lung transplants, AICD placement, placement of ventricular assist devices, andartificial hearts. The clinical experience is supplemented by case discussions with faculty and assigned readings, designed to build on the core didactic conferences that occur every 18 months. This is a 1-month rotation that will occur late in the CA1 year, or during the CA2 year. The resident will be assigned to the operating rooms at Jewish Hospital and will be supervised by anesthesiology faculty at Jewish Hospital. Curriculum: This rotation provides a focused exposure to all elements of anesthesia for thoracic and major vascular surgery and is designed to build on experiences at the VA Medical Center in the CA1 and CA2 years. 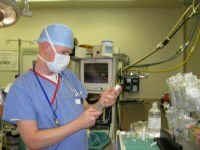 The curriculum is designed to provide the resident with hands-on and intellectual background for perioperative care of high risk patients for thoracic and major vascular surgery, including preoperative assessment of patients with multiple complex medical problems, line placement, general and regional approaches to anesthesiaand analgesia, double lumen tube placement and position confirmation, endobronchial blocker placement and confirmation, fiberoptic bronchoscopy and one lung ventilation. The clinical experience is supplemented by case discussions with faculty and assigned readings designed to build on content from lectures in the core didactic curriculum. The objective of the pediatric anesthesia rotation is for the resident to become competent in providing safe anesthesia and postanesthesia care for infants and children undergoing routine surgical, diagnostic and therapeutic procedures. Curriculum: The pediatric anesthesia rotation is a minimum two-month rotation at Norton Children’s Hospital under the supervision of pediatric anesthesiologists. Although this minimum requirement is for the CA-1 through CA-3 years, the ideal time for this rotation is between late CA-1 to early CA-3 year.